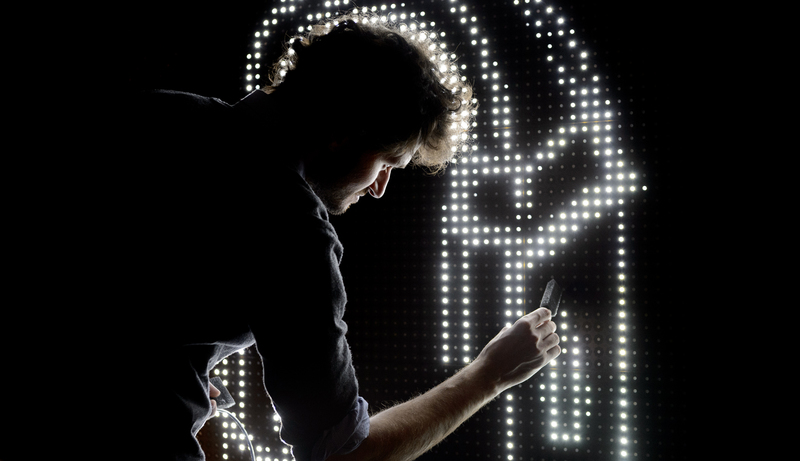 Waterlight Graffiti is a project that aims to create a material made of thousands of LEDs which lights up when touched by water. When it touches the frame of a LED, water creates an electrical bridge bringing the power required to light up the LED embedded under the surface. The wetter it is, the brighter it gets. Based on a idea as simple as bright, Waterlight Graffiti’s purpose is to be a new kind of reactive material to draw or write ephemeral messages made of light. 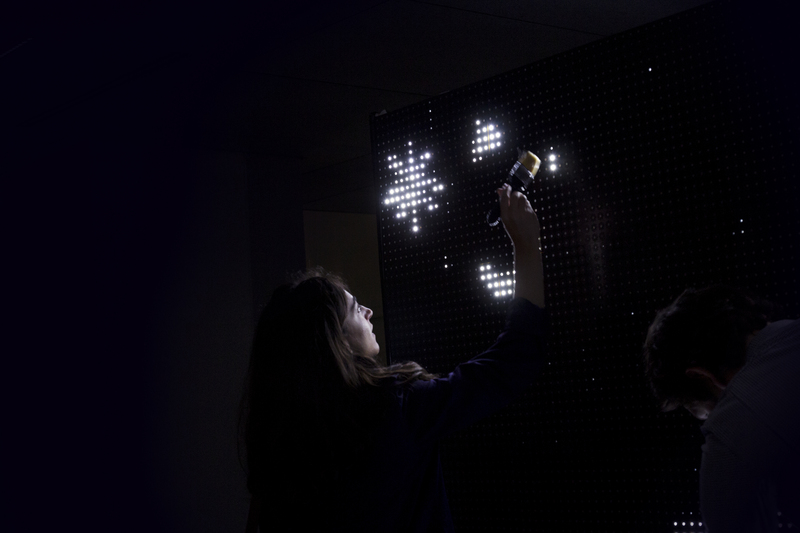 This project enables anyone to graffiti the wall of LEDs with a basic environment-friendly atomizer. To use water, which has neither shape nor colour, to draw light, is a magical experience, regardless of the public age or its artistic sensibility. This opportunity finally becomes a new kind of interaction with urban architecture. By mixing a natural element and technology, Waterlight Graffiti’s users can even play with the weather or the evaporation speed for example. Water Light Graffiti also has a surprising role during rainy days and turn them into fireworks of damp LEDs. Waterlight Graffiti, a creation by Antonin Fourneau co-produced from 2012 to 2017 by Art2m. In 2005 Antonin Fourneau received an Art Diploma from Aix-en-Provence Art School followed in 2007 by a post Diploma in Interactiv Art in the Design School of ENSAD Paris. Since his graduation, Antonin has been focused on interaction and relation with popular culture. He created a collaborative project about innovation and new form of funfair named Eniarof. Most of his research focus on the pleasure to interact with large group of people. In continuation of his research, he was selected for a residency in Japan in 2007 at the Tokyo Wonder Site. Followed in 2008 in a residence at Medialab Prado in Madrid as part of its research for the project Oterp (a geolocalised music game). He took part in various exhibitions related to digital arts. He is currently professor of Digital Arts in ENSAD and guest to teach in several schools like CAFA-Beijing.